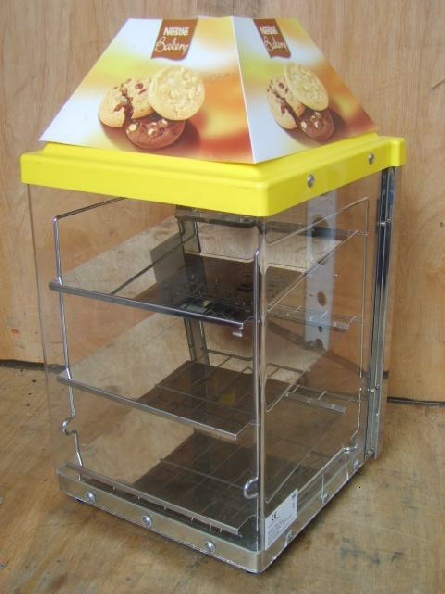 Warming cabinet hire that can cook soft Cookies from fresh dough or they will keep warm pre-made soft cookies. This is a delicious attraction for any trade stand at a trade show, the smell makes it almost irresistible for anyone to just pass you trade stand without taking a deep inhale and then hopefully stepping-up to say hello! 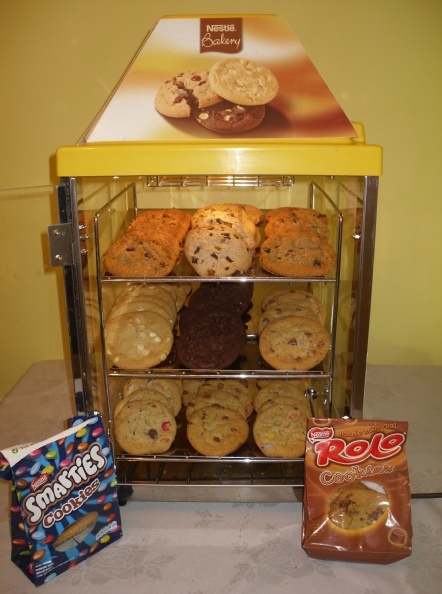 The machine will hold up to 100 pre made soft baked cookies. Adjustable digital temperature, auto set to maintain a temperature of 48 degrees. Cabinet Size; 36cm x 40cm x 67cm. 240 volt, 510 Watts, 3 amps. Alexandra Palace, Business Design Centre, The Brewery, ExCeL, Bournemouth International Centre, Donington Exhibition Centre, Donington Park, Earls Court, Epsom Downs Racecourse, G-Mex Centre, Hilton Brighton Metropole Hotel, Manchester Central Convention Complex, Novotel London West, National Exhibition Centre, Old Billingsgate, Olympia, Queen Elizabeth II Conference Centre, Ricoh Arena, The Royal Armouries Museum, Sandown Park Exhibition and Conference Centre, Stoneleigh Park, Telford International Centre, The O2 Arena, The Brighton Centre, Cardiff International Arena, The National Theatre, Roehampton Venues.